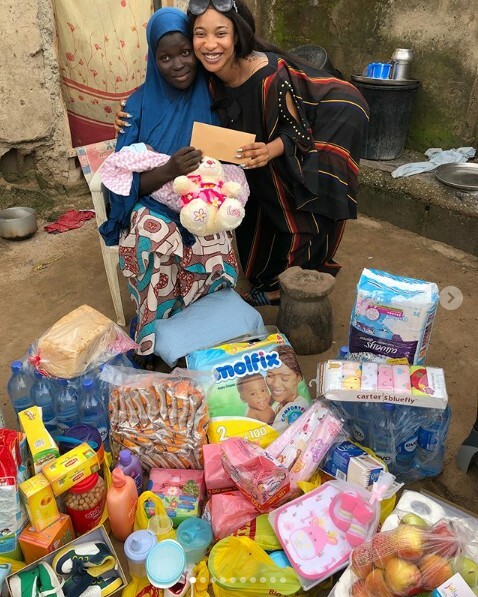 Nollywood actress, Tonto Dikeh might be controversial and full of drama some times, but she sure has a heart of Gold! We sometimes Ignore the major good things people do because of their little shortcomings which most people are also guilty of. I have never written a personal opinion post about a celebrity before, and I was not paid to post this, but seeing these photos and more of what this woman is doing with people around her and also her followers on social media is really amazing. Focusing more on the good deeds of people should be our priority. Tonto has had her fair share of social media brouhaha because of her former marriage, and in fact, she still deals with drama because people can’t stop trolling and slamming her. 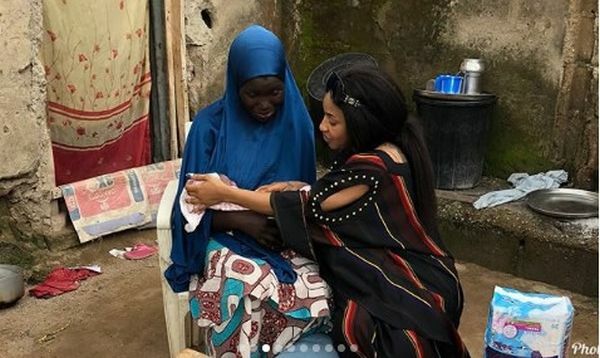 Well, enough said… Here are photos from the visitation of Tonto Dikeh to a woman who just put to bed. 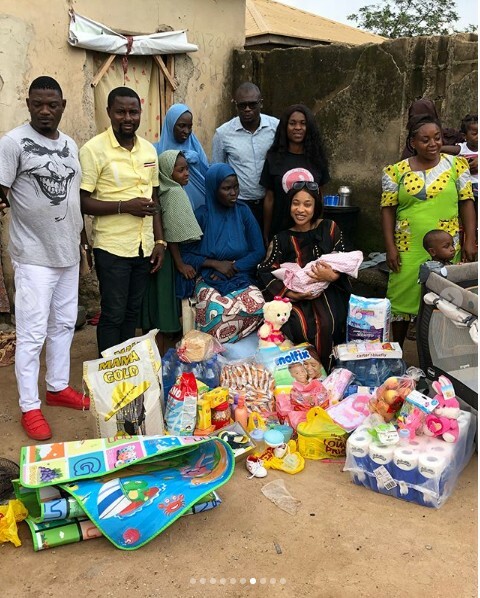 The woman was abandoned by her husband when she was pregnant, Tonto Dikeh and her foundation came to her help, paid medical bills and have now visited the woman with lots of gift items and food. “Early in the year the Tonto Dikeh foundation organized a medical outreach for the people of Dei-Dei community, Kubwa, Abuja Nigeria. We had several medical cases we attended to through the registered Medical praticitions that we worked with. Some special cases required us to extend a helping hand to further aid their medical treatment and upkeep. Mrs Zainab Ayuba was one of such special cases we had. 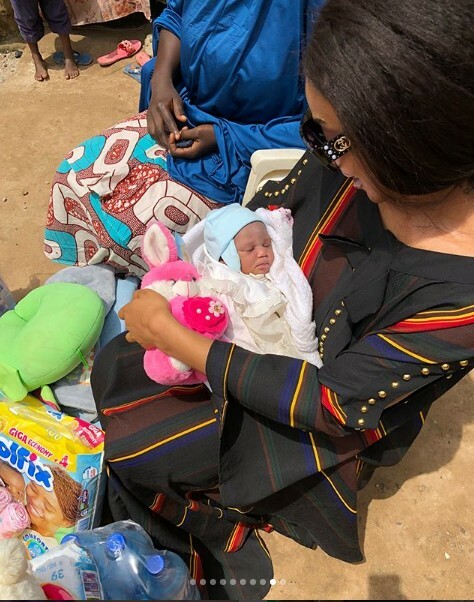 When we met Mrs Zainab Ayuba she was 7 months pregnant and as she claimed had not felt the movement of her baby in over 4days. Keep in mind that at that time she had been abandoned by her husband. Things couldn’t get any worse for her. Little did she know that her baby was not moving because she was in a coma. As a mother I knew that was dangerous. In order to avert any further complications, We instantly took her to receive proper treatment and since then we are happy to have been responsible for her medical bills!